Even before I purchased the M3, I've thought about painting the center's of the factory M3 wheels in a metallic charcoal gray to change the look of the car from a stock M3 until I could acquire some BBS RK wheels for my street wheels. 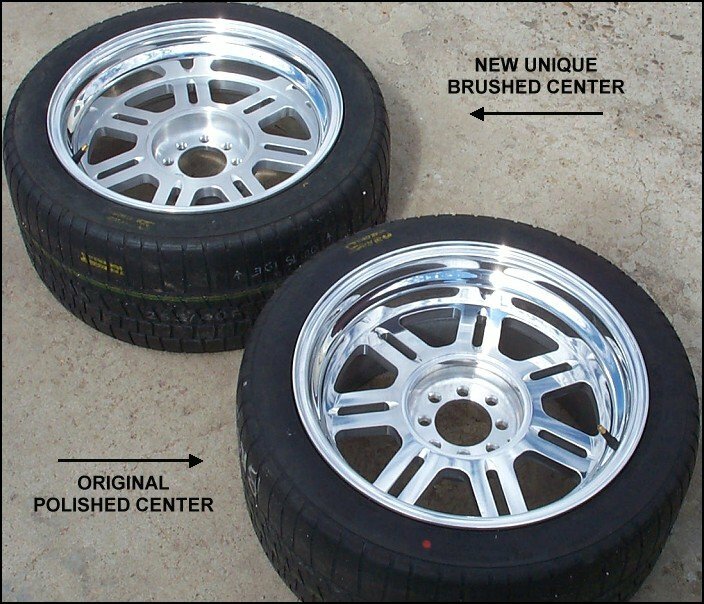 Plus, I just really like the look of a two tone wheel (especially brushed centers with polished lips on a two or three piece bare aluminum wheel like the ones I had on my Mustang). 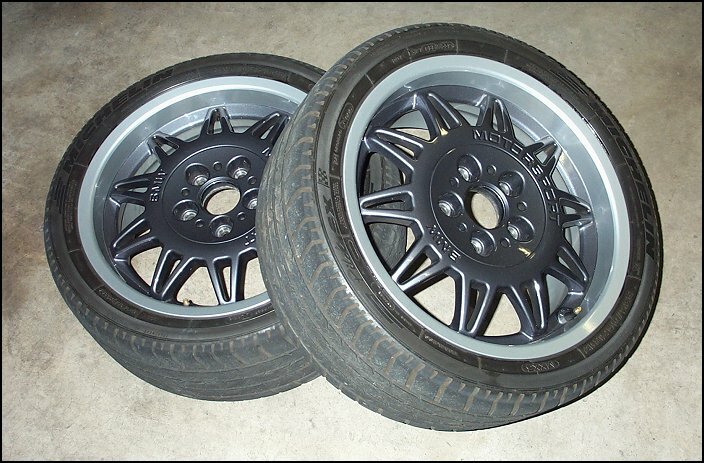 The wheels that I plan on getting in a few years for racing, SSR Comps, have an anthracite center (charcoal gray) and a machined lip, so I wanted the factory M3 wheels to have a similar appearance since they'll be my racing wheels for the first few seasons in Stock Class. I decided to go with BMW's Steel Gray Metallic (code 400) for the color after I saw an X5 in that color on the lot at the BMW dealership when I picked up the parts to make my custom rear shock mounts. A good friend of mine owns Drury Body Shop and offered to paint them for me for "free" (I also do his web site for "free" ) as long as I taped off the outer lips and prepped the centers for painting by scuffing the existing paint with 3M ScotchBrite. 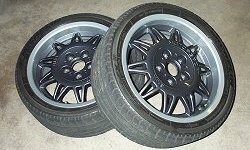 Sounded like a good deal, but taping them off and prepping them was a LOT of work... about 2 hours per wheel! The paint job turned out great and the wheels look great on the car, but they don't look good enough (to me) to change my mind about getting the BBS RKs as street wheels. The car will definitely look very different than every other stock M3 driving down the road until then, and the M3 wheels will look awesome as racing wheels now! As a bonus, the wheels don't show brake dust as easily, so I don't have to wash the wheels and tires every other day now.